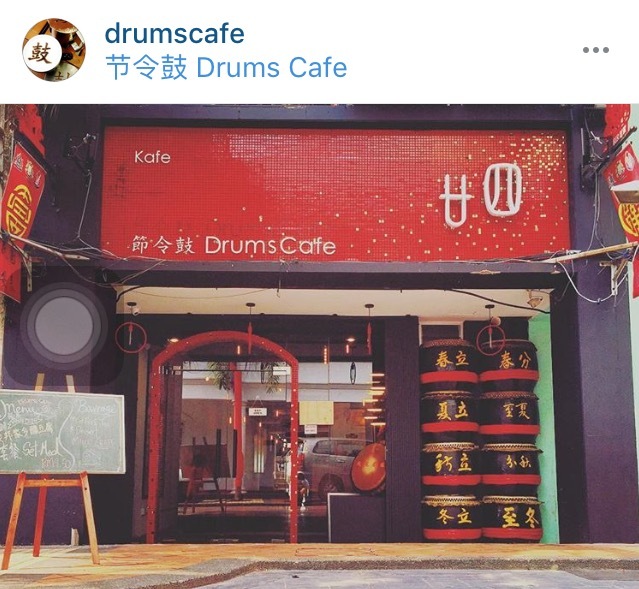 The JB Cafehopping Guide + DIRECTIONS! 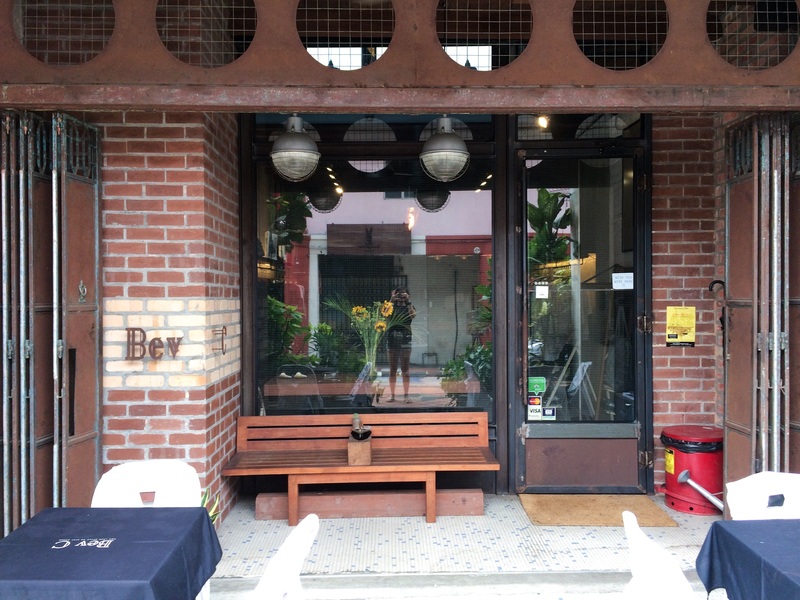 [UPDATED: 10th May 2016] JB CAFEHOPPING IS THE IN THING TO DO NOW. Serious. You want to be part of the cool kids, you better read this. HAHA! 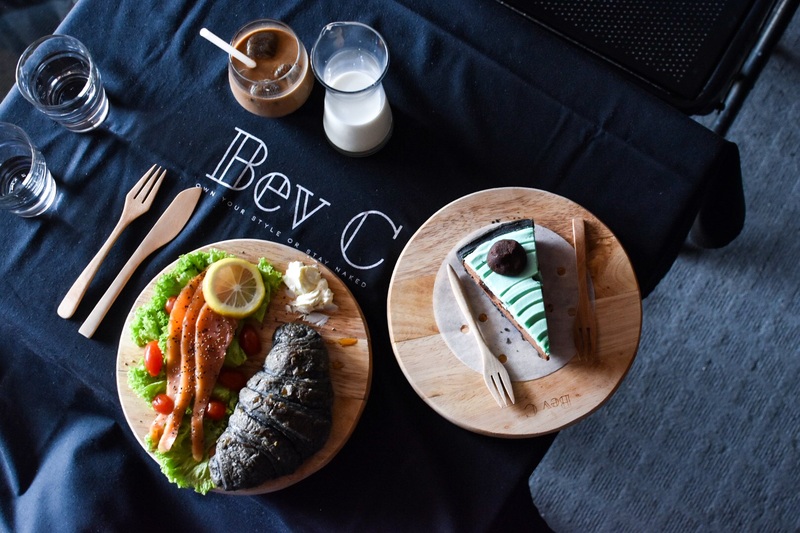 But honestly, it would be a good break for your crying wallets, as well as an eye opening experience to visit the different cafe concepts in Malaysia! While I’m really supposed to be preparing for finals, I’ve decided to come up with this list of JB cafes near the customs because I think it would really come in handy for those who intend to take a day off during reading week to head to JB to cafehop, just to relax a little. If you really are, WA, come I clap for you. Otherwise, I hope that this list would serve as a motivation for you guys to look forward to the end of finals and plan a day to head in for some really affordable fun! I never discriminate lah, this list is for everyone else who are thinking of cafehopping in JB, yet who do not know where to start or where to start combing! Just a heads up, going into JB during the weekends, and especially during the December holidays can be quite a…. test of your patience. 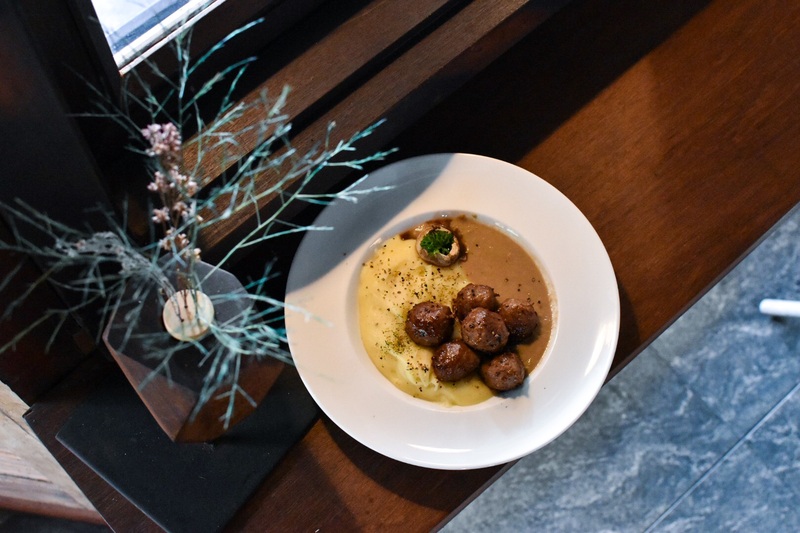 The following list is a rundown of most of the cafes within the area – 5 to 10 minutes away from the Woodlands checkpoint! I haven’t visited all of them because I’m fussy, and I only have ONE exploding belly. Also, when I’m there, I tend to get really excited about exploring and eating, rather than taking down notes for my blog post. Hence, I have gotten some pictures of the exterior of the various cafes from the net and have given due credit! 4. By then, you should be able to see the road names like Jalan Tan Hiok Nee and that’s where your adventure begins. Also, don’t be put off by the old and rundown buildings in the area and think that you’re in the wrong place. Yes, their cafes sprout out of nowhere. 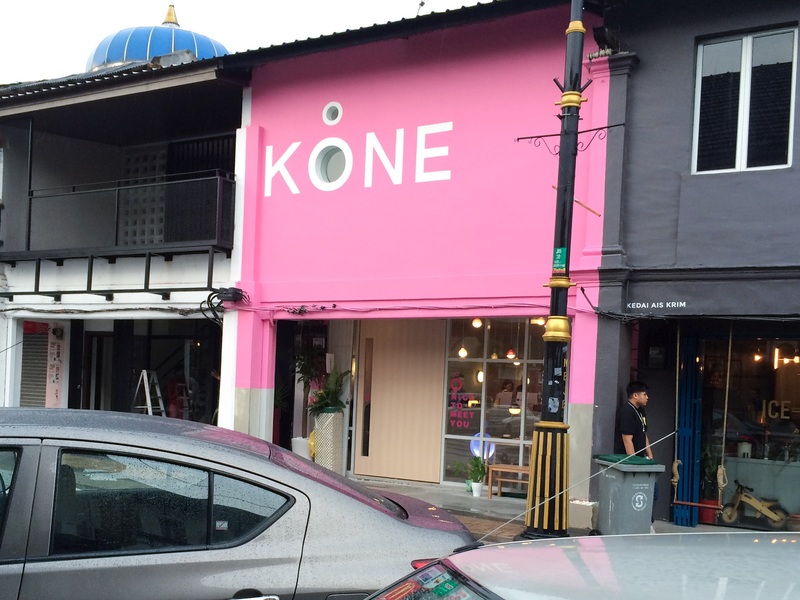 When you suddenly see a sleek, modern shop exterior, that is probably a cafe. I’ve added pictures of the exterior, just so you are able to recognize them along the streets. Also, I’ve tried to categorize the places along the same stretch to facilitate your cafehopping experience in JB! 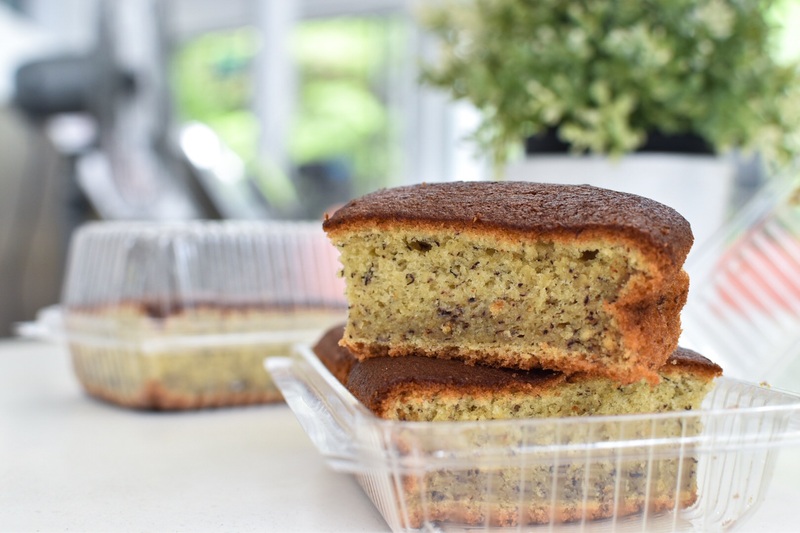 Okay, this is NOT a cafe, but this MUST NOT be missed when you’re in the area, because their banana cakes are to die for! So are their breads! Have I belly flopped here? YES. 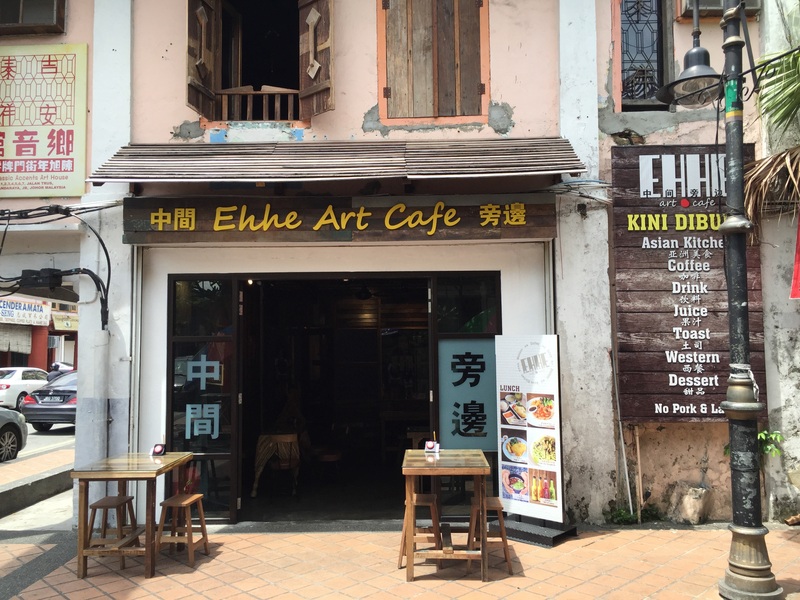 Located just BESIDE Hiap Joo, you wouldn’t miss it. 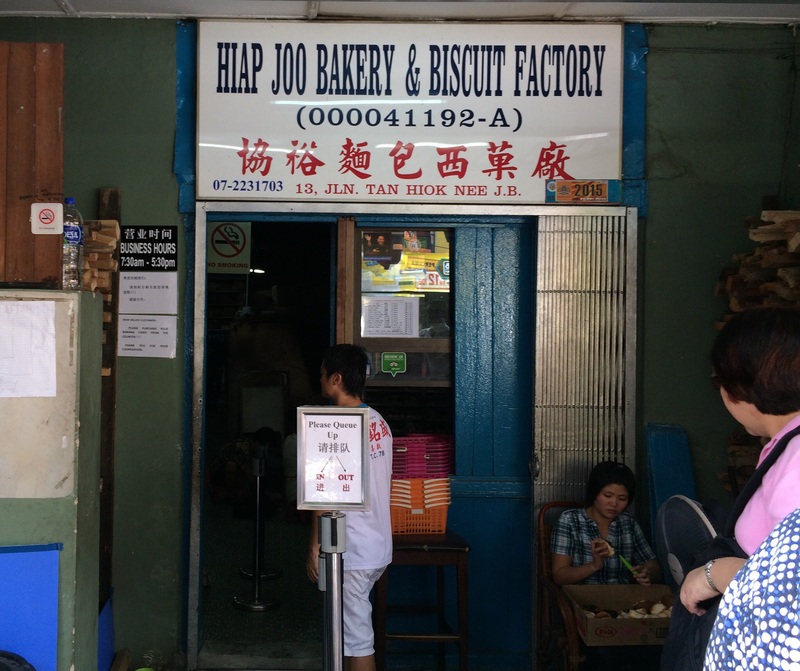 Specializing in their millicrepe cakes, it is a really spacious place for you to chill and have a coffee while waiting for your fresh bakes from Hiap Joo! Have I belly flopped here? No. Because I’m not a fan of millicrepe! 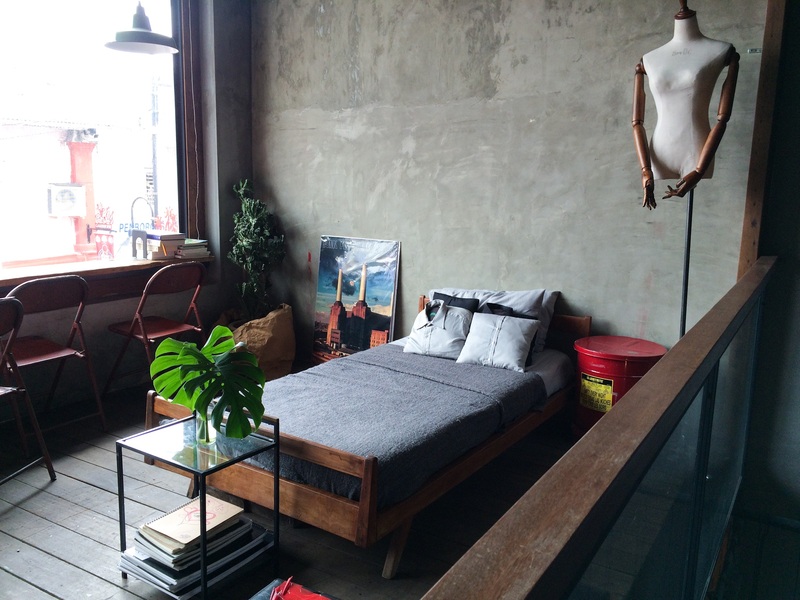 JUST next door of Maco Vintage, you will find Chaiwalla & Co! 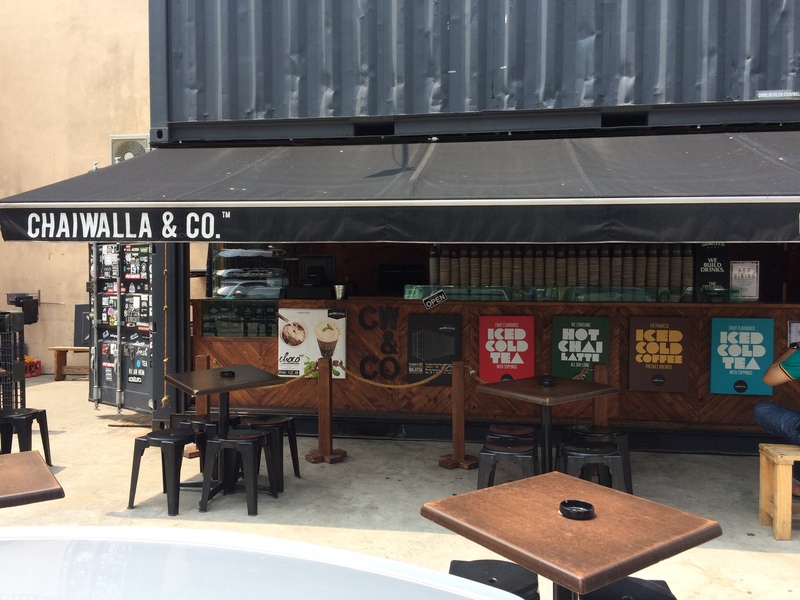 An interesting concept as a container cafe, it was one of the cafes on my bucket list because it’s so cool right? 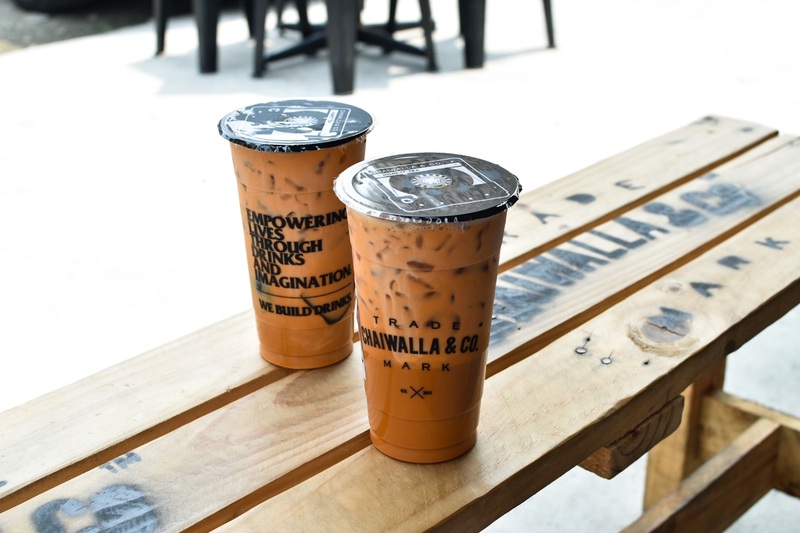 They are best known for their Thai milk teas, but they do serve other teas and coffee as well! It can get really hot though, depending on the weather! So.. Dress light! Have I belly flopped here? YES! Ask for thai milk tea less sweet, it’s shiok and less sweet. HAHA! I can’t find an exterior shot of this place, I shall head there to take it the next time, but if you were to go in the direction of my post, you will find Coffee Time on your left turn from Chaiwalla Co.
It’s apparently not very popular on social media, and honestly not very aesthetically appealing as well. So.. Hmm.. Visit it if you run of places to go, I guess! If you do not intend to pop in here, head straight towards the RED HOUSE for more cafes – below! Have I belly flopped here? No. But I passed by probably like 7 times. You should be able to spot a Red Building called Red House when you are done with Chaiwalla Co., that marks a start of a street filled with hipster cafes. 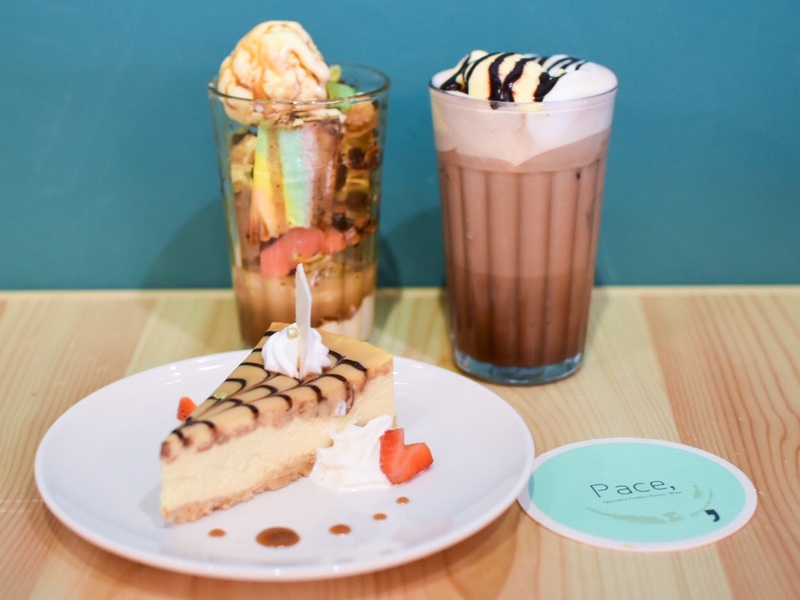 One of which is Pace Cafe! I LOVE their choice of color, really. And their interior is really spacious as well! They seem to be specializing in coffee, with a choice of different beans, and also serve a limited selection of pastries! No hot foods are available for now! They do serve up some sandwiches and muffins now! They have just opened their Wine Lounge too! We went for the cheesecake affogato, and hey! They gave us rainbow cheesecake! Okay i am happy now! Have I belly flopped here? YES! Wifi available! If you’re into drums and such, perhaps this is a place for you as they are uniquely festive drum themed! Have I belly flopped here? NOPE! 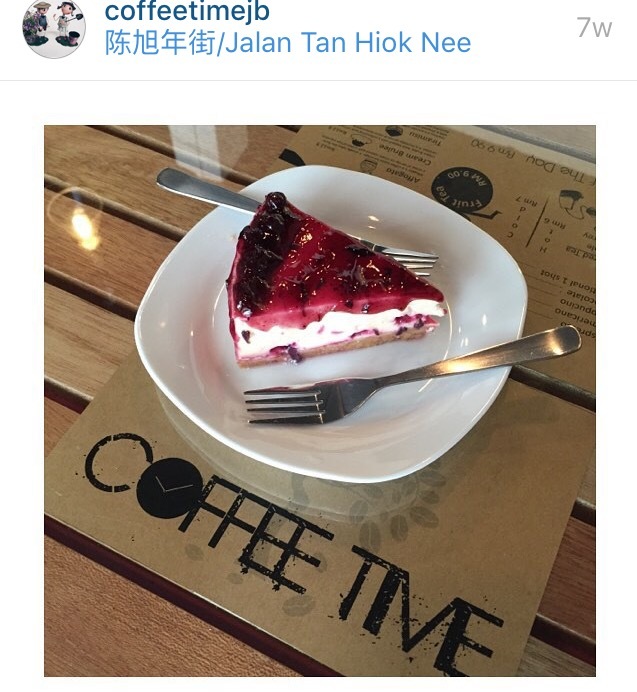 One of the most instagrammed JB cafes. A boutique on the first level and the cafe on the second. What could I say? Its interior was a charmer and probably trumps any of which we have in Singapore. They even have a bed in there! Limited menu! I’ll be doing up a review when I have the time soon, and you guys can check out their menu. For now, here’s our spread! Have I belly flopped here? OF COURSE. FREE WIFI TOO. In love with this place. You’ll notice that there are about 2 to 3 more cafes in this area. However, they are not immensely popular or have closed down out of a sudden, like Art 52 cafe! A pity though because Art 52 has SUPER CUTE FOAM LATTE ART! There is also Coffee Valley, that is situated on level 2. I think I’ve missed it somehow on both my trips there! Next time, next time! Making a U-turn out of here, back to the Red House, head West. Aiya, I don’t know how to say but when you u-turn towards the red house then you turn to your left, you should be able to see IT Roo. I think. This is all according to my memory, and I hope I’m right. Even if I’m wrong.. Ehhhh the cafes damn nearby each other okay! Google map! It’d be like a 2 minute walk! 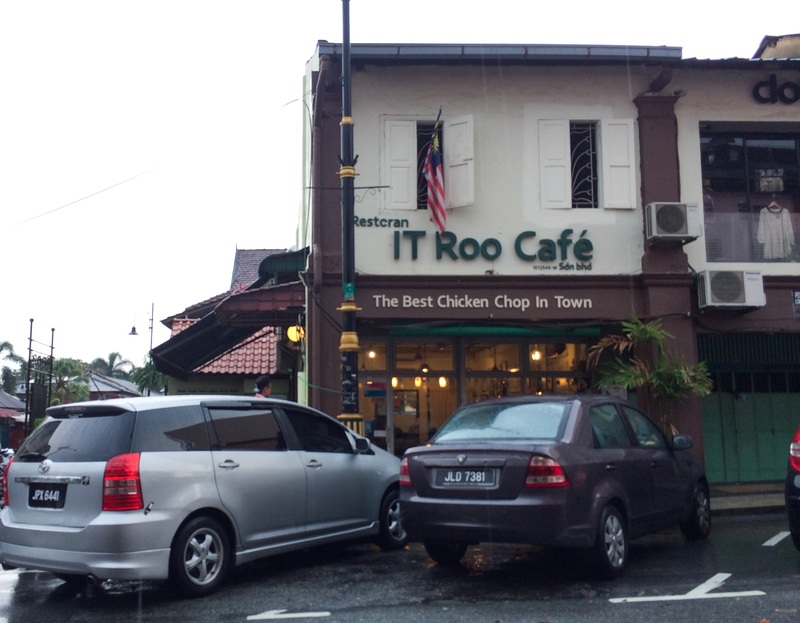 They are best known for their FRIED (not grilled ah) Chicken Chop – BEST IN MALAYSIA (NOT JUST JB) hor. This HUGE slab of chicken chop was juicy and succulent (actually ain’t that OMG DAMN GOOD KIND). Guess what though, it only costs RM15 for the one without the egg, and RM17 for 2 eggs. That’s $5 and $5.70 respectively. But trust me, THAT SLAB IS HUGE. If this doesn’t entice you, maybe the fact that they have root beer float too, just might! 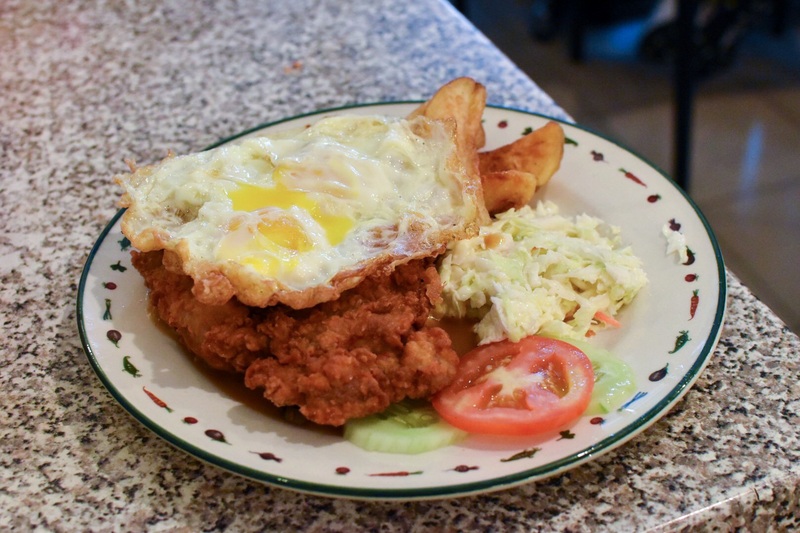 Not a fan of chicken chop? They have other Chinese food too! Have I belly flopped there? Yes. BURP. 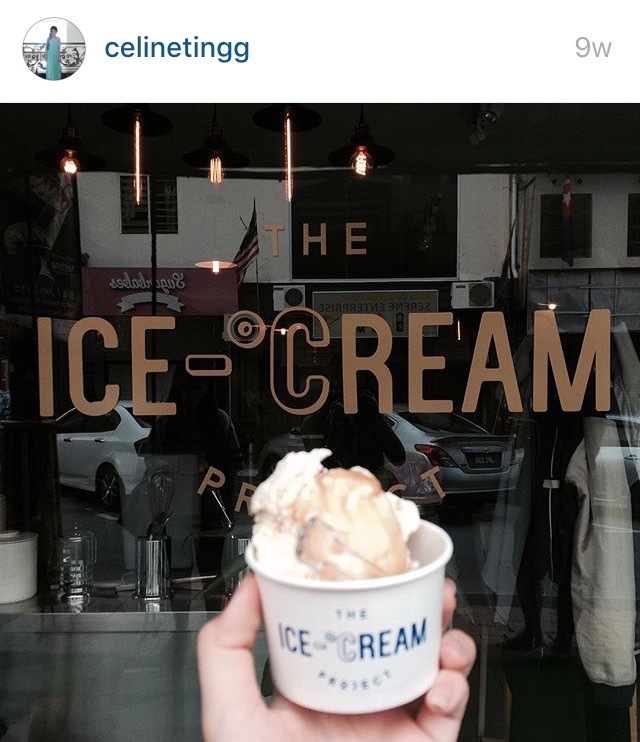 A BRAND NEW Ice cream place that was opened just 3 days ago on 10th November! Sorry I can’t seem to find them anywhere online and we did not try them yesterday because we were too full. And there is simply just too many ice cream places around. From just ONE to THREE, in fact, in the month of November. You wouldn’t miss this place with its striking pink, located just OPPOSITE It Roo, and just beside The Ice Cream Project. Wa, is it head to head competition? Have I belly flopped here? YES FINALLY. Review up SOON! Nope, I didn’t visit as well for the abovementioned reasons. 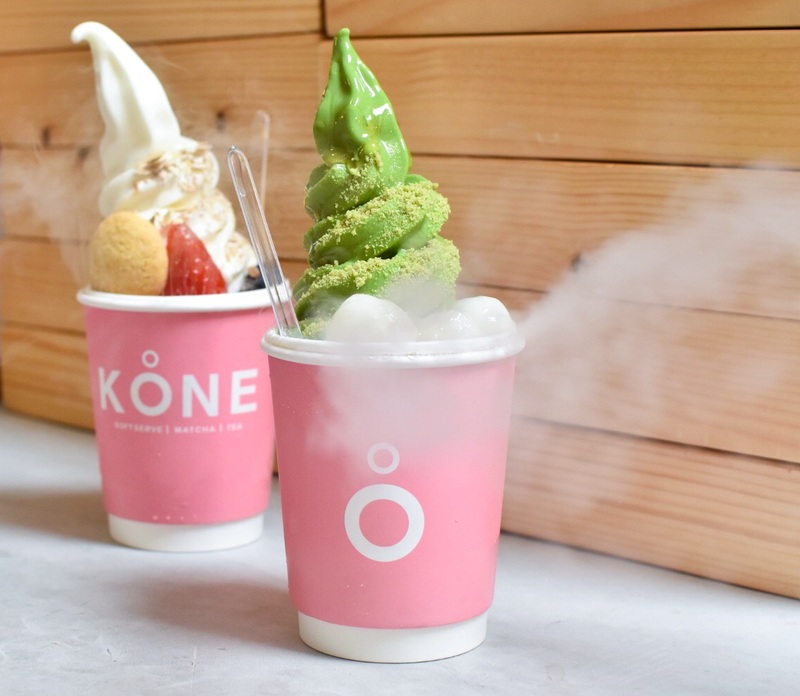 But TIP has been a hit amongst foodies and ice cream lovers because these ice cream are made upon order, using liquid nitrogen! Similar concept to what we have in Singapore, such as the likes of 320 Below. Have I belly flopped here? *rubs belly* I cannot. The latest Ice Cream competitor enters the already saturated area, located just opposite Koone and TIP. Wow. 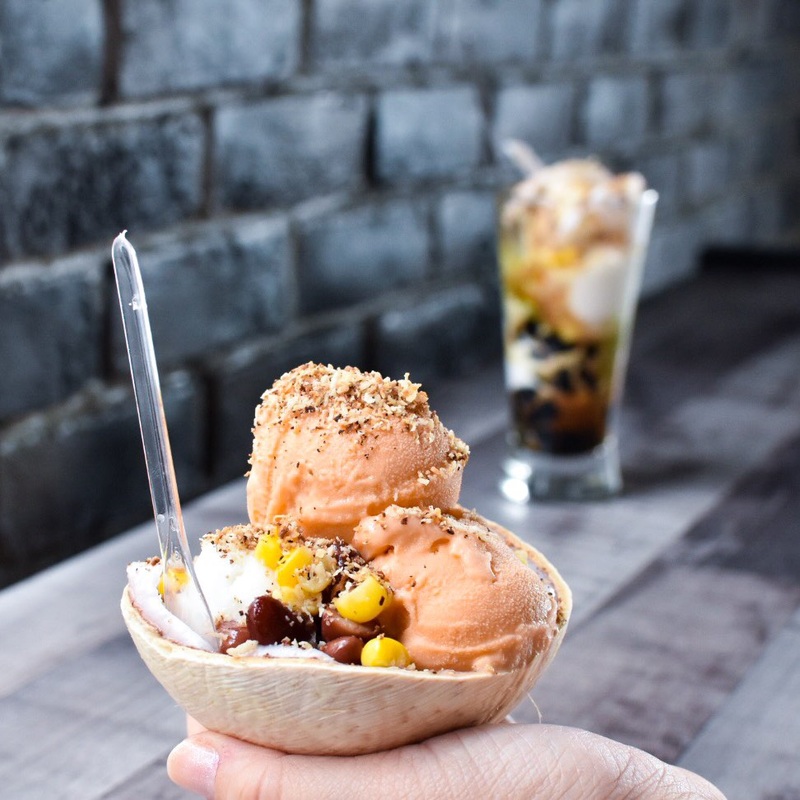 Sangkaya serves up pretty amazing ice creams with their signatures being their Thai Milk Tea scoop as well as their COCONUT ICE CREAM. Really refreshing especially in this incredible heat. This was *SQUEALS* number 1 on my list. Because I’ve seen so much on Instagram, I just can’t. Hyperventilates. AS you can see from this picture, you can spot KONE, then to the right is TIP, and 2 doors down will then be The Replacement! SO WHITE. SO PRETTY. I love the whitewashed interior too! 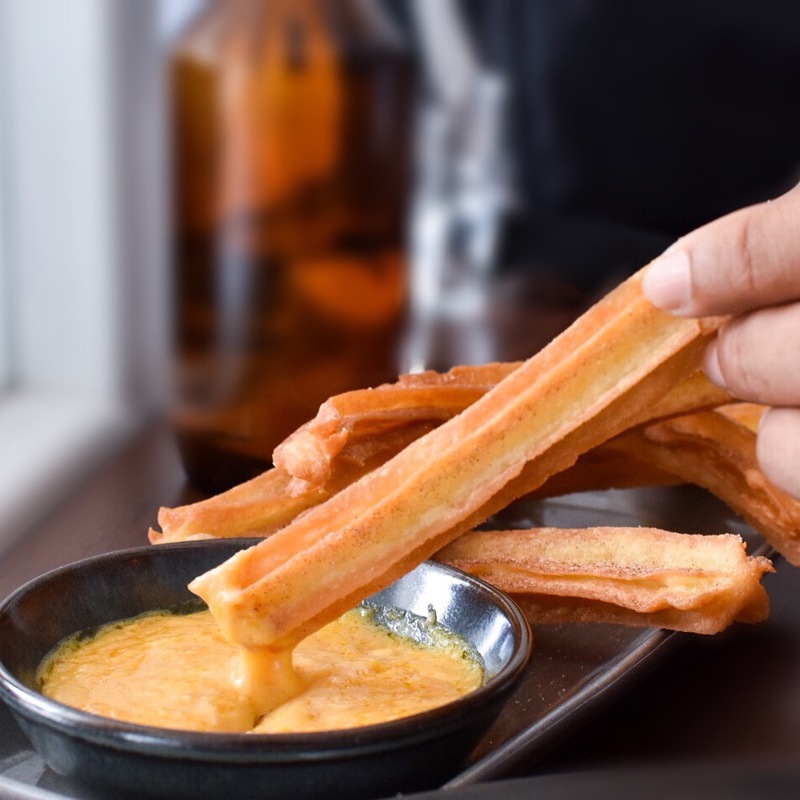 They serve up a usual brunch fare and you will realize that the first page of their menu has their CHURROS offerings. Opt for the Dark one if you want cocoa bits studded within your BLACK churros! I didn’t know the color so unique leh, until I checked instagram after I left the place! Nonetheless, we’ve got the SALTED EGG sauce with churros. 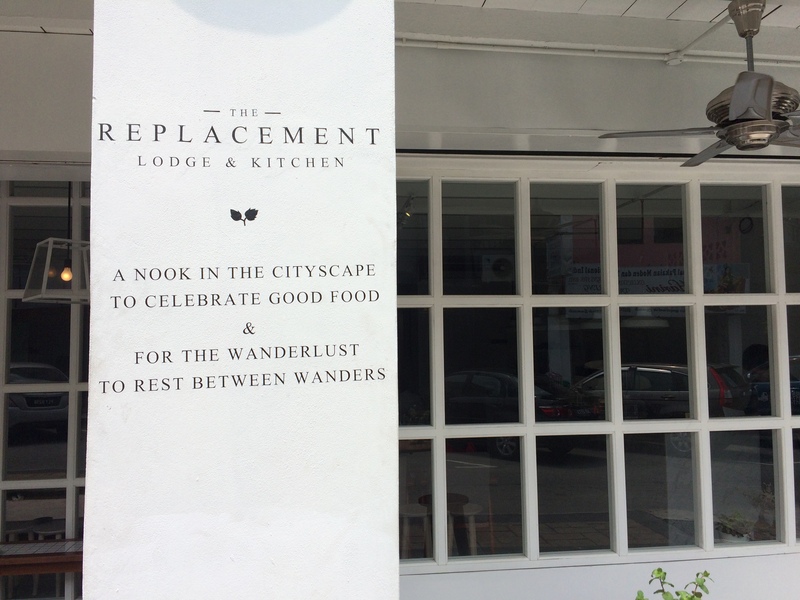 Not bad lah, not entirely great either but their brunch is definitely VALUE FOR MONEY! Have I belly flopped here? YES. And I’m still in LOVE! | Wifi available! You wouldn’t miss this, as this is diagonally opposite Replacement, and its exterior is PRETTY MASSIVE in my opinion. They seem to be advocates of the recycling movement, so you’d notice a lot of wood works and this and that – REFURBISHED. We headed there for their lunch, even though they seem to be quite known for their froyo as well. Then again, they had MEAT BALLS. How can we resist? Nothing impressive, but just really homely, best for the rainy weather. Have I belly flopped here? YES. And my belly was pleased. WIFI Available! 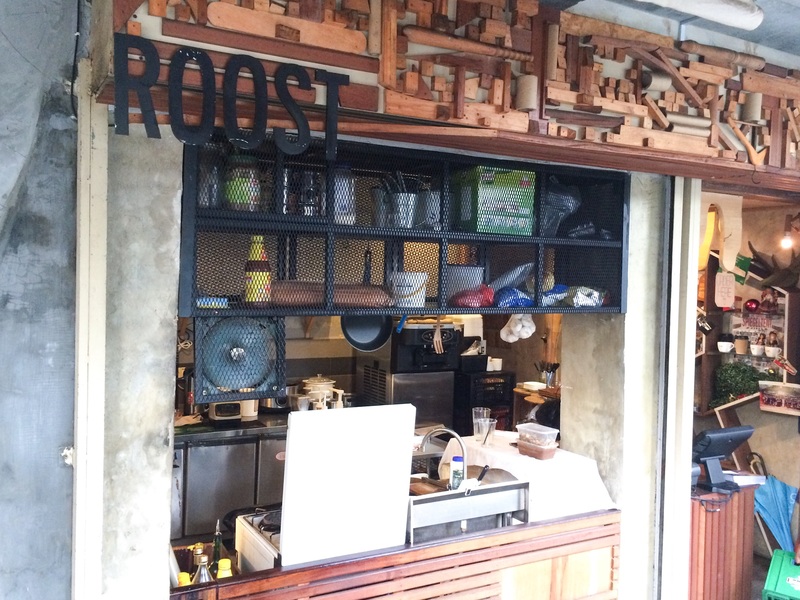 They seem to also have a Roost Juice bar as well, somewhere along Jalan Dhoby that serves up chinese food! 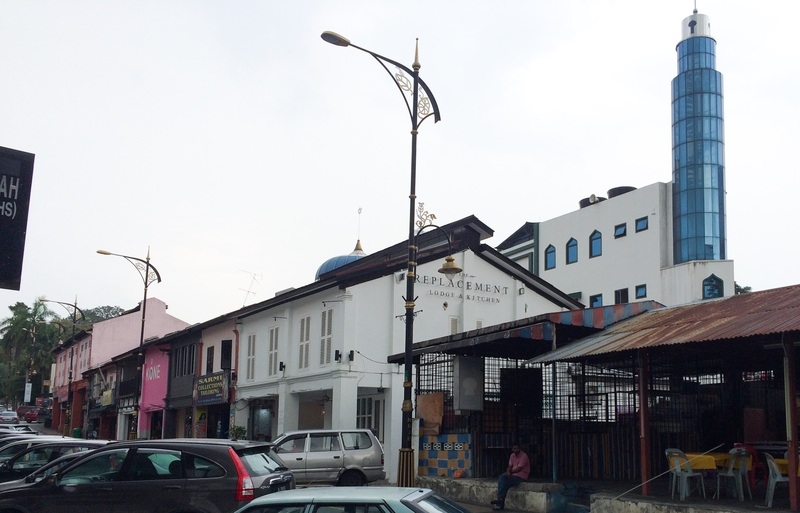 After you are done with your meal, turn right to walk along the street of Jalan Trus! 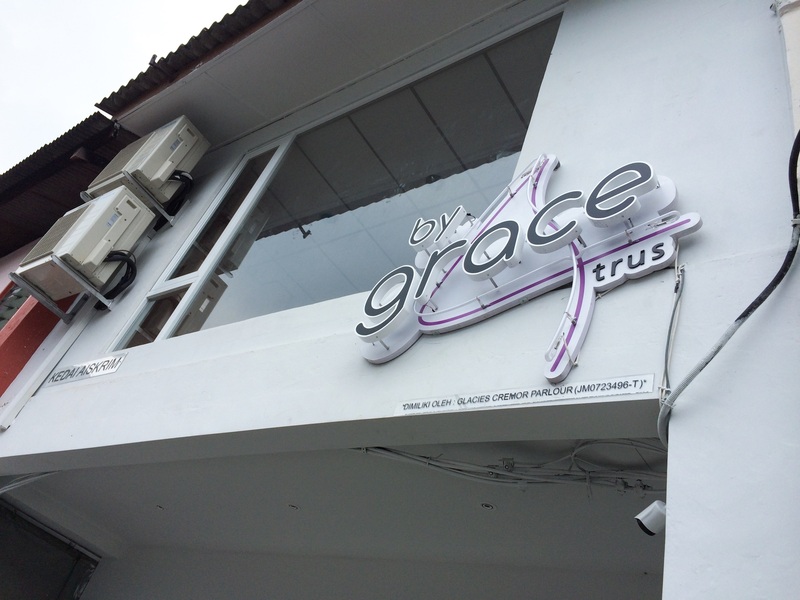 Just a FEW doors down lies By Grace, the brand new soft serve outlet in the area, opened just yesterday! We randomly found it because its glass windows and sleek exterior just caught our attention ( like what I’ve mentioned earlier, as long as it looks damn new and nice, usually is a cafe in this area). 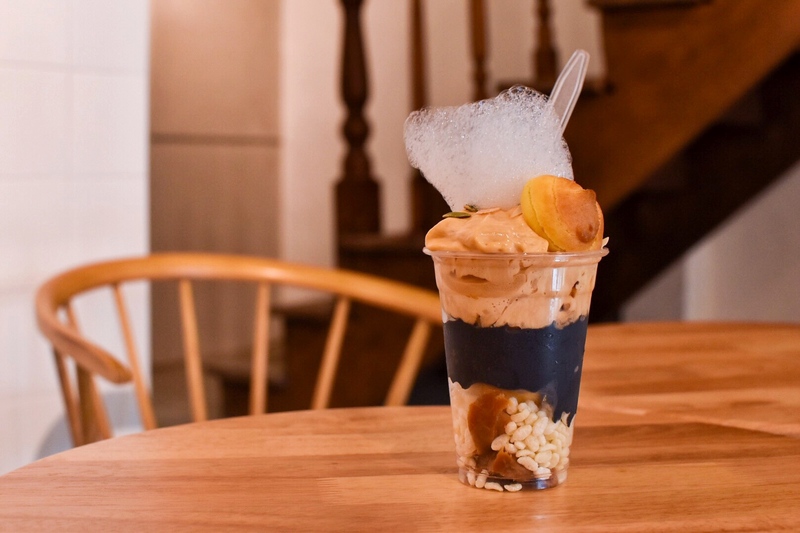 They currently serve up 5 different flavors, all of which come with the charcoal soft serve scented with earl grey. So it’s basically an earl grey charcoal soft serve! Very yummy, but being priced at RM17.90 to 18.90 was a little hard to swallow in this area. Have I belly flopped here? YES. The earl grey was YUM! I’m not even a fan of earl grey. One of latest addition to the area in Jalan Dhoby. 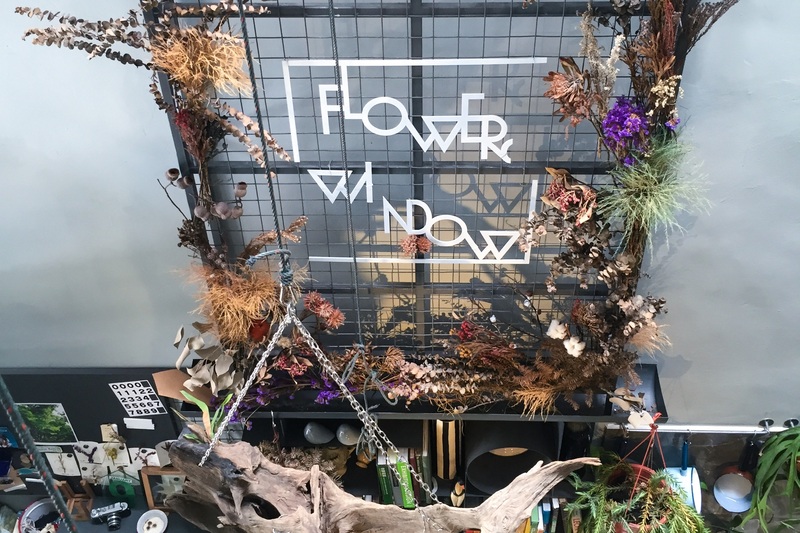 This place literally has flowers in the window. No lah, mostly leavesHAHA. PHOTOGENIC, PHOTOGENIC PLACE. But from what I gather, the food was just.. Okay. 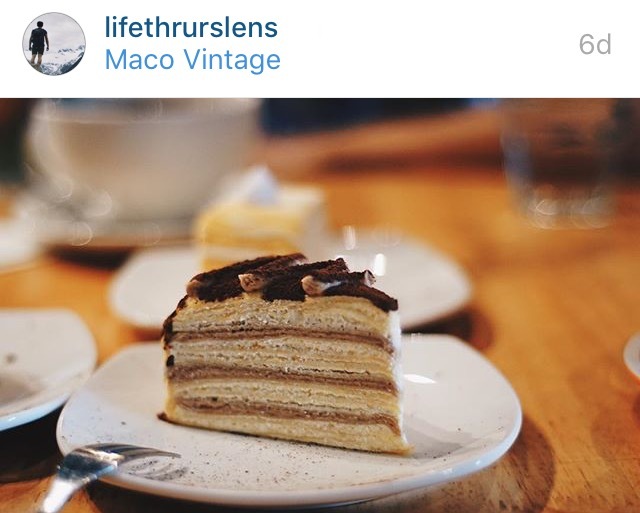 Good to visit for your OOTDs and instagram worthy pictures! I’ve checked them out myself and after trying out one of their cakes.. I agree with majority of the reviews! 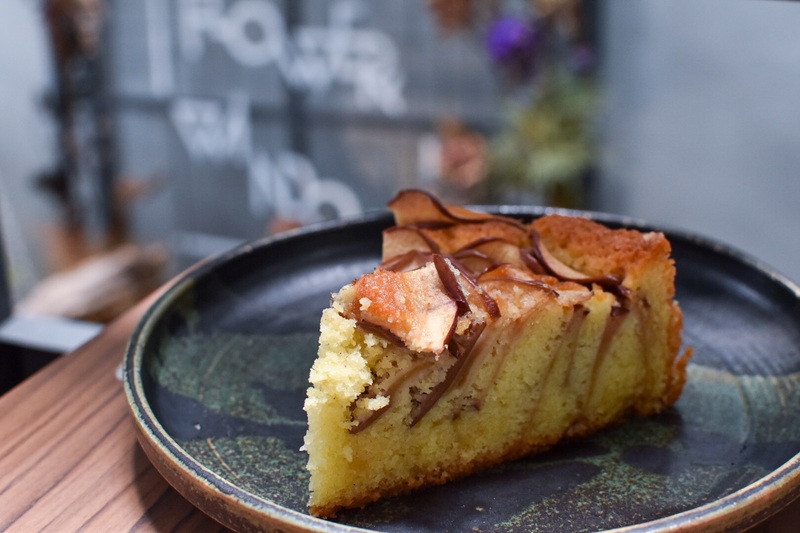 Apple petal cake was just a case of disappointment – dry and meh. Have I belly flopped here? Yes! 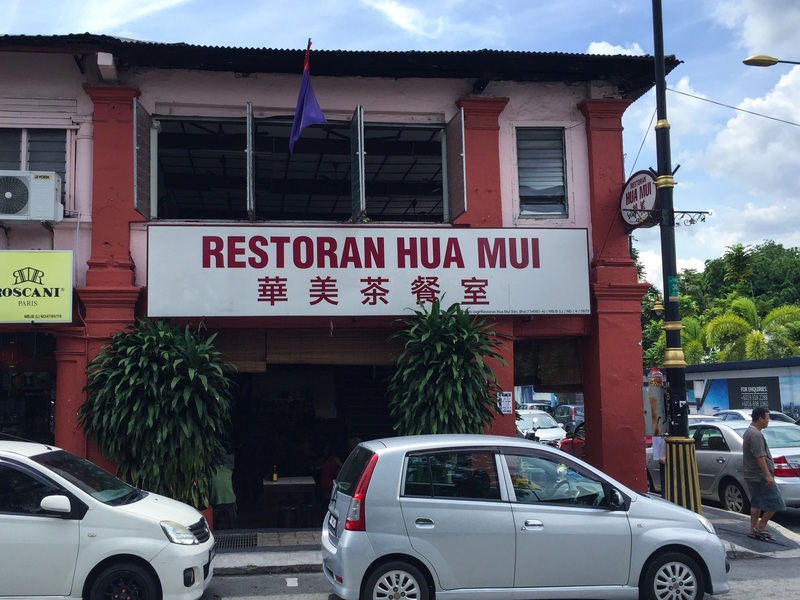 Along the stretch of Jalan Trus also lies EH-HE, which is apparently closed for a while now, and have notices stuck on the outside about looking for chefs and all. Please someone go apply so they can open again. Update! They are opened now! And they are located JUST BESIDE HIAP JOO! Have I belly flopped here? Nah! Known for their traditional breakfasts and very substantial mains like chicken chop, nasi lemak and American breakfast, I’ve decided to pay them a visit because I’ve exhausted my excitement for the cafes in the area. Hehe! They are located just down the stretch from Replacement and diagonally opposite Roost! Hits and misses on their breakfast offerings for me, I’ll do up a more elaborate blog post soon! But traditional is always comforting. Old is gold definitely. Kam Long is on the same stretch as City Square Mall. If you exit the mall facing the Jalan Dhoby area, it will be on your left. 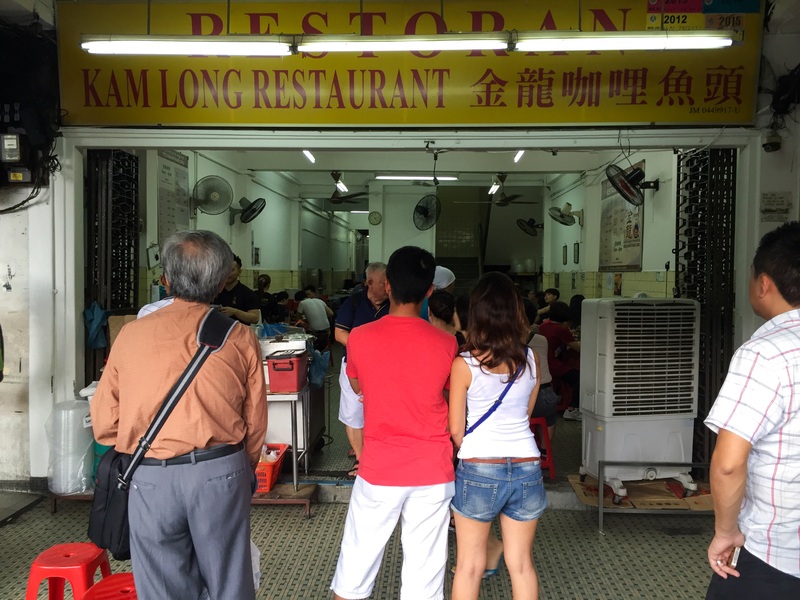 Once you near them, you definitely won’t miss this place with the CRAZY queue! 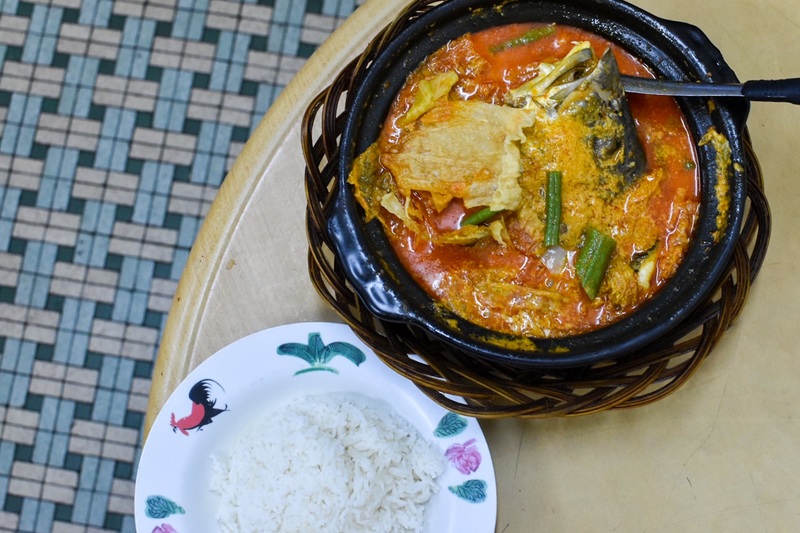 They only sell one item – Curry Fish Head/ Tail. And you can find throngs of locals here. I guess that says a lot. 😉 S$7.30 for this pot of goodness. If your friends do not take spice, trust me, this place would suit them as well because it’s NOT spicy! It’s just really flavorful and amazing. Here’s a bonus. If you don’t want to get out of the airconditioned mall, City Square has its fair share of decent restaurants and hey, a cafe! 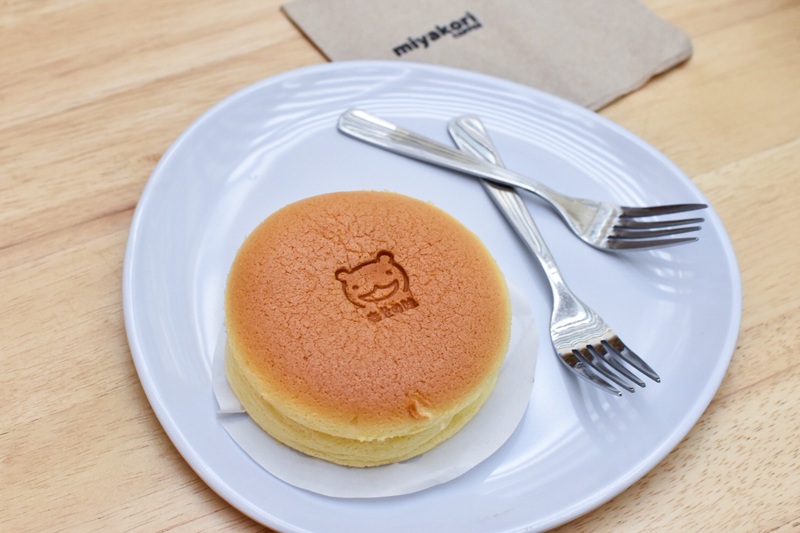 Miyakori serves up a pretty good baked cheese cake! Warm, and fluffy, it’s a good place to chill while you wait for your movie to start or something! HEHE! 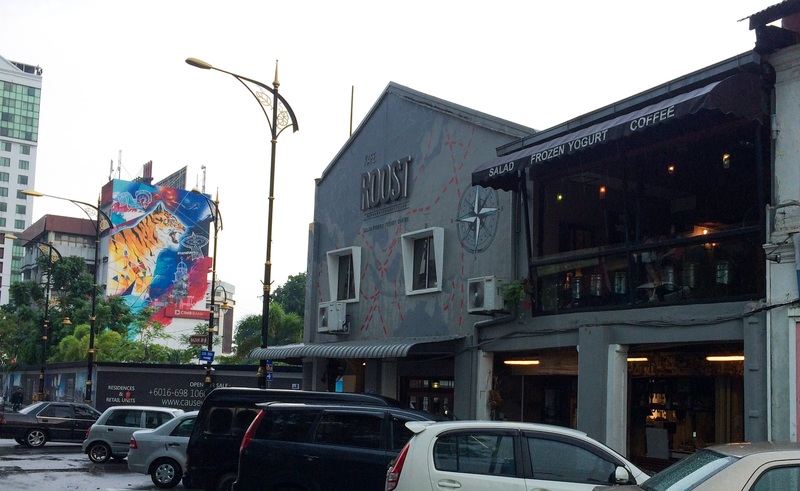 Heading in the other direction of Jalan Trus, you will find the popular, old bird – Faculty of Caffeine [HALAL]. I did not pay them a visit because their menu did not appeal to me at all! I hope this list has helped, and the grouping of the cafes by their areas made your cafe hopping experience in JB much more accessible! If all else fails, i.e. my explanation sucked, then rely on google maps! They are all just literally a stone’s throw away from each other. Not even exaggerating! Do leave a comment if I’ve missed out on any interesting cafes in the area! 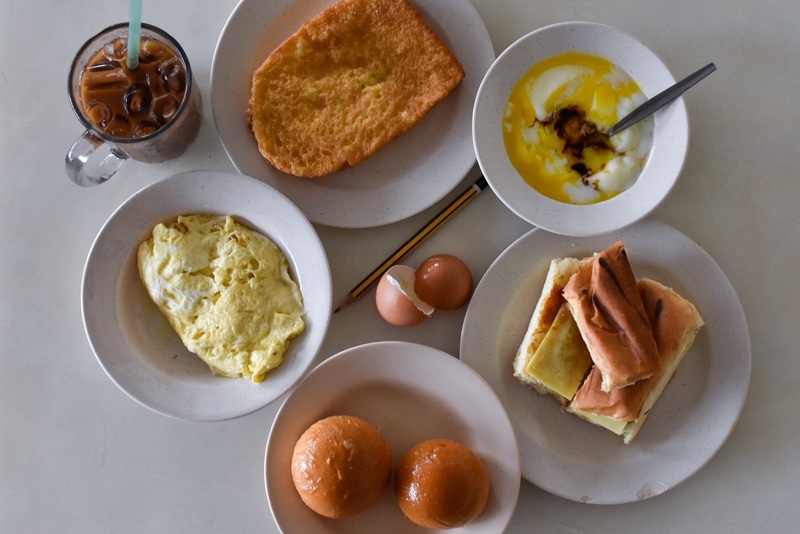 If you can’t travel to JB and LOVE SALTED EGG, here’s my MOST updated list: CLICK HERE. I’ll be updating this post with the links to the more detailed reviews of the different places, so you can take a look at the menu and prices, as well as pictures of all the food! Also, more cafes further into JB will also be reviewed for those who want an adventure and are able to drive into the area! P.S. This post would not have been possible without Mokdetama, who has willingly brought me to explore this area and finish up all the food that I couldn’t. Thanks for your patience for my 15-minute pre-meal photo snapping ritual as well. EB SAYS THANKS, AND SO DO EVERYONE WHO HAS READ THIS POST. I will soon! (: Thanks for the recommendation! Hi! Thank you for sharing, this is amazing but i’d like to ask if by any chance these cafes are all halal? Hello! I’ve updated the statuses of the cafes! For those without, do bear with me as I’m still verifying with the cafes! 😀 Hope I’ve helped and do share it with your friends! Thank you for putting all these information together. Can’t wait to food hunt in Johor soon..
My boyfriend and I recently tried Flowers in the Window. We were lured there by an article on their Home-made Herb and Spice Infused Syrup with Rosemary, Chilli and Lemon. My boyfriend loved the drink, said it was unique and refreshing. I also thought that their brownie was fresh, thick, and really chocolatey. We tried a pasta dish too, can’the remember the name of the dish, but it was green, with chicken, and it was excellent. 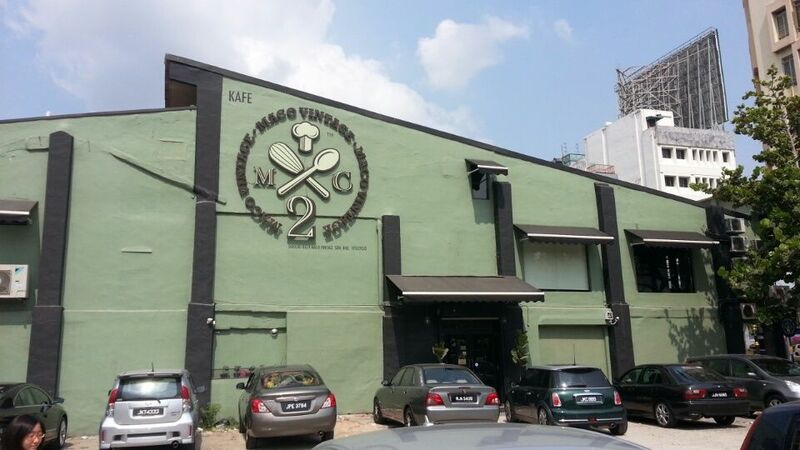 Perhaps you tried the wrong dishes for your review of their cafe…? Hello! I didn’t particularly say anything negative about their food because I haven’t tried their mains! Just thought it was pretty average, nothing to shout about honestly, especially with the sprouting of cafes in the area! Glad you enjoyed your visit there! 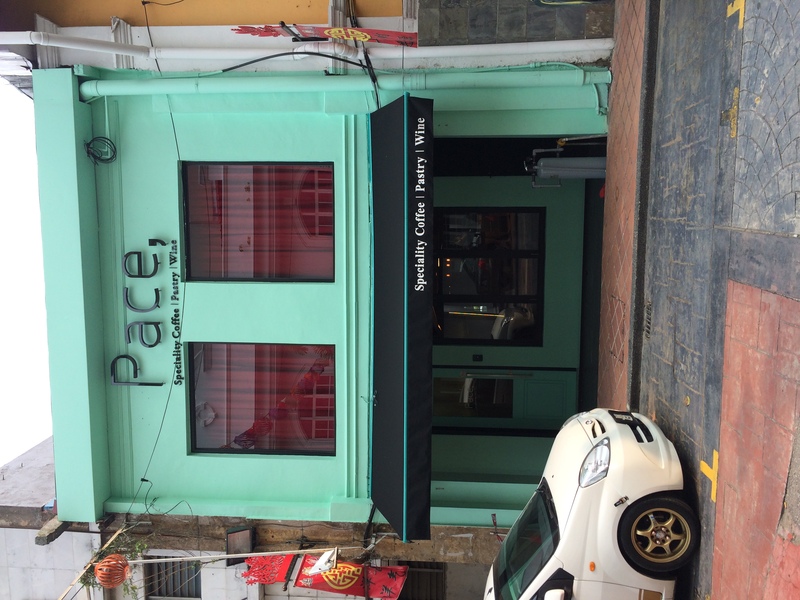 Hi Pace cafe have moved to a new location. Hi there. 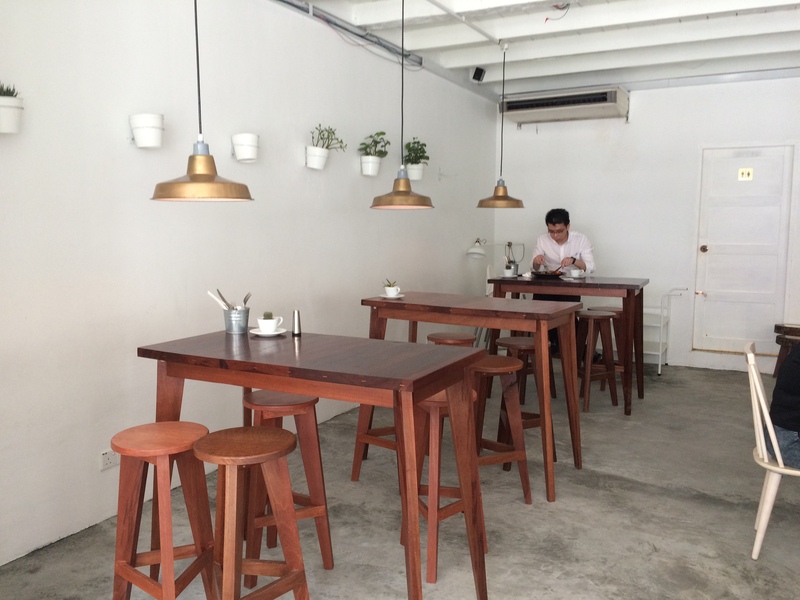 Mind to check out B.L.O.C (Banana Lounge Café) formerly Pisang Café @ Block A, #1-40, Southkey, JB.